This great app is free “app of the week” from the Apple app store but you have to move soon. Using your iPhone or iPad camera,the app corrects high quality photos for parallax and sharpens text/images of documents (even, as below, my Mac’s screen) and saves as .pdf then seamlessly gives upload options to Dropbox and Evernote, among others. Need to save a transit schedule? A Map? A certificate? A design? A ceramic tile? A texture? 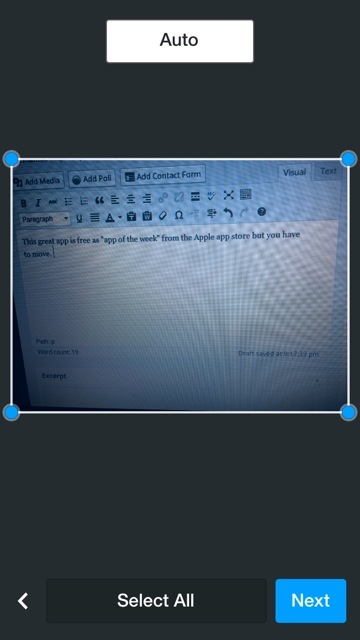 This entry was posted in app guru, Breaking Forums, and Reports, Mobile &Phone, Tools and tagged app of the week, apps, free stuff, IOS, iOS7, IPad, iPhone, mobile, Mobile device, scanner. Bookmark the permalink.